What is Retrofitting vs. Replacement? In most cases, people are turning to LED lighting solutions for energy efficiency and savings, but the cost of replacing all light fixtures in a home can be high, and it requires some electrical expertise. Replacing fixtures involves removing the old fixture and replacing it with an energy-efficient solution. Thankfully, these solutions usually take up less space, but you can run into wiring issues that require a licensed electrician. The alternative is simply to change the bulb to an LED alternative, but that may negate some of the benefits of LED fixtures. If you’ve ever tried to change a light bulb immediately after it goes out, you know it is hot! That is not the case with LED lighting solutions because they are energy efficient, so they don’t produce as much heat. Halogen lights expend most of their energy as heat with very little remaining for light. LED lights only use a fraction amount of the heat to emit the same amount of light. This means that they can be touched immediately after going out, but it also means they rarely burn out! Because they don’t get as hot, the components of LED lights last longer. Heating and cooling can reduce the integrity of metal and plastic parts in traditional lighting, but this effect is greatly reduced in LEDs. 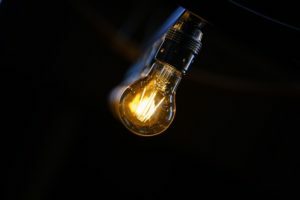 If you think about replacing the lightbulbs on fixtures that are over the stairs or in other hard-to-reach areas, long-life bulbs sound like a great idea. LED bulbs may last 10 times longer than traditional bulbs. Since LED lights do not have filaments, they are much stronger than traditional bulbs, so they can be used for a variety of applications. Since they don’t produce much heat, they are also safe to install in small areas. In traditional incandescent bulbs with filaments, lamp shades were a fire hazard if the shade was out of place. Additionally, filaments could be broken with minimal movement. LED lights reduce and practically eliminate this problem. LED lights do not contain harmful metals such as mercury, and they don’t produce much UV light, which can be harmful. Their energy use reduction means that LED bulbs don’t emit as much carbon dioxide as traditional bulbs. Overall, energy savings are good for the environment. 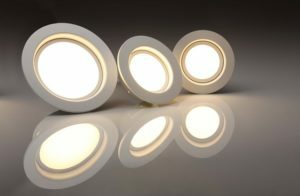 LED lights often cost a little more than incandescent or halogen bulbs, but that is changing as they become more common. Regardless of the minor increase in cost, LED bulbs save a significant amount of money in energy expenses. It used to be that LED lights only came in a limited amount of options, but that changed quickly as popularity increased. LED now come in dimmable and multi-color options. They can be controlled via smart phones and other smart home devices. They can even be made to appear like traditional bulbs with faux filaments but all the benefits. There is basically no downside to LED lighting. So why replace a fixture instead of a bulb? It may seem like a lot more work to change a fixture instead of a bulb, and in some cases, it is. It is perfectly acceptable to only change the bulb, but there are some times where it is recommended or even necessary to change the fixture. LED light fixtures take up less space, which can be very convenient when installing new fixtures in small spaces. Recessed lighting may not have been an option in an old basement with minimal clearance, but LED “recessed” lights do not require the space and are very slim. In some states, building codes require a limited amount of fixture wattage per room. If you are installing or have traditional fixtures, you will not be able to have as many. Along with codes, states have been incentivizing homeowners to choose energy-efficient home options. Check for rebates in your area, and installing LED fixtures may save you more money than retrofitting bulbs. Lastly, LED bulbs for specialty lamps can be hard to find and expensive. If you find them one time, it may be more difficult or may costly the next. Halogen and incandescent lights are quickly becoming dinosaur relics of the past. Upgrading fixtures makes finding light bulbs and easy to solve problem. In many cases, it is okay to retrofit lighting in a pre-existing home. The bulbs are getting cheaper, and the benefits are very similar to what you get from changing an appliance. However, LED fixtures are now the standard for new construction, so if you truly want to update your home, do it the right way be installing LED fixtures. Call an electrician to upgrade your lighting fixtures, and you will ensure that your fixtures are installed safely and up-to-code. Then, you can relax in a world where the lights rarely go out, and where you know that you don’t have to turn off the lights to reduce your energy bill.